I'm really looking forward to another year of setting little goals each month. 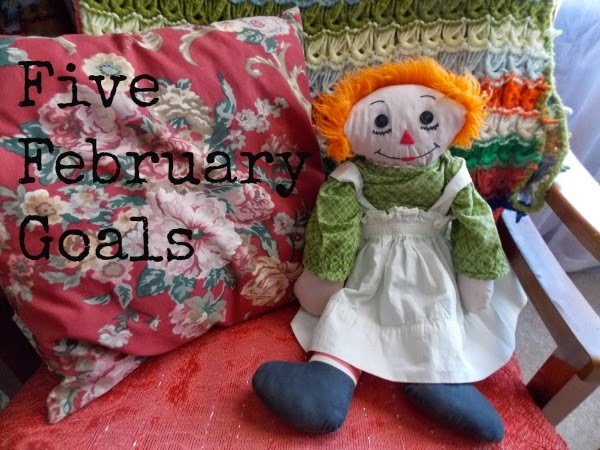 Like last year, I didn't set any monthly goals for January because I was busy setting up my yearly goals, so February marks the beginning of my monthly goals for 2015. 1. Write 1000 words each weekday. I'm working on a writing project at the moment that I'm really excited about. It's been a long time since I've had time to focus on writing but I'm at a season of my life now where I'm able to. The hardest part is actually sitting down to start each day, but crossing off a list and putting a sticker on my chart helps motivate me. I had an almost perfect record in January so I'm hoping I can beat it in February. 2. Practice Spanish sounds and spellings in my Anki trainers (by Fluent Forever) daily. This is something I never thought I'd say, but I am LOVING learning Spanish! These cards make it super fun, it's like playing a game each day. I find myself recognizing words and sounds that I don't remember knowing and it's just super exciting. I can't recommend enough the book Fluent Forever if you're wanting to learn a new language! 3. See the movie, You're Not You. This movie looks inspiring in the best way. It looks like an incredible movie on friendship in the midst of a horrible disease and the power one person can have in giving hope. 4. Get rid of two more garbage bags of stuff. This doesn't seem to be a difficult one for our family, we have a giveaway box by our door that somehow continues to fill up as we de-clutter our lives. But this goal is for me, personally. I want to get rid of two garbage bags full of MY stuff. 5. Read two books. I lap up books like they're chocolate pudding, but sometimes I can get sidetracked with life so I'm putting this as a goal this month to keep myself on track. What about you, what are you hoping to do this month? I have one goal for February, as it stands right now. Get my latest picture book draft ready to show my critique partners. Everything else I'm taking day by day. Good luck with your goals, especially that writing one! That's a fabulous goal, Rebecca, and a time-consuming one as well. Good luck!